This is a very ambitious book. The author, Hubert Engelbrecht takes a holistic view on geology, minerals extraction, and the hugely interlinked webs of civilizational use of the resources. He looks into the processes and consequences of 250 years of industrialization for minerals, ecosystems and life. This concentrated synopsis, which attempts to consider all kinds of interactions between humans and nature, opens the eyes for the enormous sizes and momenta of transformations generated. The author chooses to introduce his subject by describing how natural cycles of matter and energy were modulated by geological and extra-terrestrial processes as well as by evolving life. He distinguishes two kinds of life, one evolving seemingly in a deterministic manner and generating the oxygenated atmosphere; and the other culminating, in a non-deterministic manner, in intelligent organisms capable of escaping from the constraints of photosynthetic energy: the miracle of the emergence of humankind creating innumerable artificial niches in the technosphere. After a short history of industrialization, the author brings the reader down to the basics: how core and lifeblood of industry work and how its output grew with time: mining, processing and further refinement of immense amounts of mineral commodities, used to meet the demands of 7.5 billion humans. But nothing came without side-effects. Extraction and processing of minerals and the industrial use of biological resources caused multiple and serious environmental impacts - e.g. atmospheric warming, acidification of oceans, eutrophication of lakes, pollution, deforestation, and an accelerated loss of biodiversity. In a subchapter on atmospheric turnovers, natural and artificial processes are compared. For a strategic approach to reduce unwanted damage, the author observes the gap between the amount of resources extracted and processed and the amounts safely discarded or recycled. It is the large number of open loops that impair our ecosystems and indeed our health. The author finishes with listing up decisive reasons, which caused the actual ecological crisis and mentions ideologies, economic systems as well as innate and learned behavior of humans. This book is recommended for reading for students and professionals of engineering, chiefly mining and civil engineering, of business economics, and indeed of political sciences and humanities. The purpose of this book is to make public discussions on the part of the extractive industries' play: they are primary economic drivers and carry a considerable part of responsibility to promote sustainable practices and environmental protection, as well as controlling speed and direction of the transformations. Their products are indispensable for the economy and they provide positive contributions - creation, knowledge, culture, and life, - but also risk, conflict, hazard and destruction. The current, irreversible transformations on planetary scale are part of the most complex, singular and enormous experiment ever conducted. This book offers a responsible, generalist view on rising global ecological problems caused by transformations resulting from long-term industrial extraction of mineral raw materials, their manifold utilizations, and rising number of individuals consuming them in ever increasing amounts. Climate change is only one problem among many that were caused by significant alterations of natural cycles, especially the carbon, nitrogen, and water cycles. Other problems, all characterized by violations of precaution, prudence, mindfulness and restraint, are unpredictable in the long-term. The unexpected side-effects, developmental speeds, trends, and extents of these problems are our moral responsibility to solve, though some may be irreversible. Many improvements were made during industrialization. But a grave cultural crisis arouse at the same time. Because it is unreasonable, insensitive, and at high risk, to cut and interfere on huge economic scale into a natural system: merely a few hundred years of techno-scientifical development cannot have resulted in sufficient knowledge of that system, which evolved and diversified infinitely in a time-abyss of ca. 4.5 Ga. Mankind overstrained itself by economizing the best from ingenious human brains (inventions, ideas) and from the earth (mineral commodities), resulting in incipient loss of control. It is unwise to damage ecosystems, which prospered on a planet orbiting in one of the very rare habitable zones in space. Engineering assessment and advice from the humane and ecological disciplines should be better included, because the fire of Prometheus entailed the serious consequence of the opening of Pandora's Box. 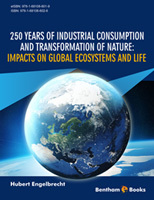 This study intends to connect, as postulated by physicist H.-P. Dürr, profound expert knowledge with the broad and deep ranges of environmental geology and ecology, which are constituents of the science of consumption, conversion, and transformation of nature by humans. This interdisciplinary approach, which attempts to fully describe the complex human transformation of nature, occurred mentally from outside: i.e. virtually from space onto the globe, in order to obtain a general view on all areas affected by industrial development and to realistically represent magnitude, speed and momentum of the resulting changes.